ECO Bank account is the banking solution that gives you access to CIB Bank mobile and internet banking essential tools for managing your money. You can open this account completely online. Open it in 10 minutes! 1 The monthly account management fee of CIB ECO Bank account is HUF 0 if within a period of one month, the minimum wage is credited to the bank account by credit transfer (even in several installments). In the bids of the Bank until May 31, 2018, the required amount of monthly credit - a minimum of HUF 84 788 monthly credit. CIB internet banking and mobile app are secure and flexible so you can easily consult your balance and use your money. Personalize your spending limits to make sure you always control how much you spend. Feb 27, 2019 Bankszámla üzletszabályzat - 2019.05.01. 1 The monthly account management fee of CIB ECO Bank account is HUF 0 if within a period of one month, the minimum wage is credited to the bank account by credit transfer (even in several installments). In the 3 calendar months following the month of the opening of the account, the Bank does not examine the credit terms, the monthly account maintenance fee will not be charged during this period. The first account management fee will be charged in the 4th month following the month of the opening of the account, if the Client fails to fulfill the given free account management condition. If in the previous month at least the prevailing minimum net salary was credited via transfer on this bank account (cash deposit and transfer between Client’s own accounts are excluded), even from more than one transaction, the Bank will not charge the monthly account management fee, it will be HUF 0 for current month. 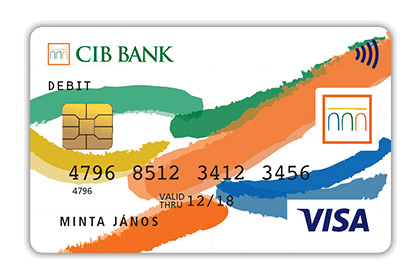 2 The special offer only applies to the first VISA Inspire Electronic Bank Card, requested for the account holder by name, with a CIB ECO Bank Account opened during the promotional period of between 1 January 2018 and 31 December 2018. For customers who already have a bank account and switch to an CIB ECO Bank Account, the special offer may be requested only if the customer does not have an activated electronic debit card at the time of switching the account apckage. The detailed terms and fees relating to VISA Inspire Electronic Bank Cards are contained in the Bank Card List of Conditions for private individuals. 3 For the purposes of the CIB Visa Inspire Electronic and the CIB VISA Inspire Embossed Bankcard, members of the Intesa Sanpaolo bank group are: Italy – Intesa Sanpaolo Bank, Croatia – PBZ Bank, Egypt – Bank of Alexandria, Slovakia – VUB Bank, Slovenia – Banka Koper, Romania – Intesa Sanpaolo Bank, Bosnia and Herzegovina – Intesa Sanpaolo Banka, Albania – Intesa Sanpaolo Bank, Russia – KMB Bank, Serbia – Banca Intesa, Ukraine – Pravex Bank.